Keeping in mind, ever-evolving requirements of our valuable clients, we are offering quality assured Branded Card Holder. Fabricated and developed in accordance with the latest trends and fashions, we offer this card holder in numerous color combination and pattern options. This product is precisely designed and developed from top quality leather and using top quality threads. Our clients can avail the exciting range of this product at very economical prices. 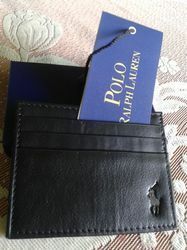 Looking for Branded Card Holder ?